I've recently bought an acoustic guitar (nylon string). However, the guitar doesn't produce a clean sound. It gives some kind of noise when I play it. In addition, I face little difficulty when trying to fret a note, especially the lowest notes. Is that normal? Because I'm a beginner, I don't really know where the problem is. I'm not an experienced guitarist and cannot really decide exactly what is wrong. My guitar is not a famous brand, but it was the only one I could get because there aren't many guitar shops around. The brand name is California and it's made in China. 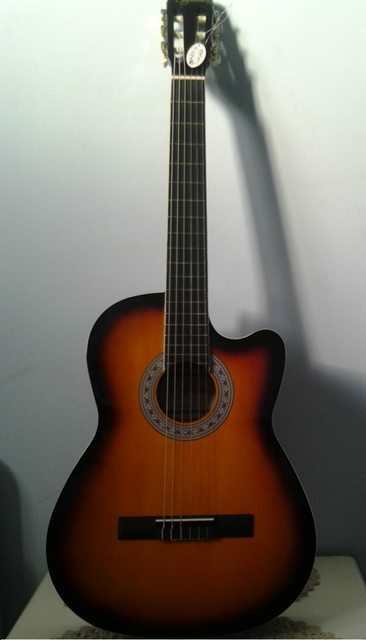 I got it new for $200 along with new strings after a long time of searching. I bought it when I could not find an acoustic steel string guitar. PS: the noise comes from the "A,E" strings but the other ones sound really good, when i play on these two strings, they produce some kind of buzz sound that may last for some seconds. I know that may sound normal but I'm being a bit skeptic about this.looking at my guitar it seems as it has no problem with the body shape or the action so that may assure me a bit! On a purely practical level, I would suggest having another guitar player play the guitar - preferably someone with some experience playing nylon string guitar, but any acoustic guitar player will do. If you have a friend who plays guitar fairly well that's perfect - have your friend check the guitar out for you. Bottom line: Find another human being who plays and has some experience with guitars and he or she should be able to help you determine if there's anything wrong with your instrument and, if not, maybe help you determine what the problem with your early attempts at playing might be. The noise could be coming from almost anything: a loose pickguard, a loose strap button, something in one of the tuners, etc. Most likely though, you are hearing string buzz which is caused by the string vibrating against a fret somewhere along the neck. There are many ways to fix the buzz. Usually having the action set properly will fix it. In extreme cases the offending fret may need to be filed down. A very beginner player may cause buzzing from not pushing the string all the way down when fretting or other fingers/hand slightly pressing other strings accidentally. Another possibility is that the guitar isn't tuned up to pitch. If the strings are tuned lower than they should be, they will be loose and will buzz all over the place on frets. Simply tuning up should fix the issue. The last possibility may just be that you're playing too hard. Nylon strings are typically meant to be played with the fingers rather than picks and are a bit quieter to begin with. I honestly didn't know the answer to this question (for myself) until I was much more experienced with the guitar. If you are a young teenager for example you probably won't notice the difference too much, because you're just so happy to be making cool sounds with a cool instrument. But an adult beginner can get quickly frustrated if the instrument is just unplayable. Most modern-made guitars, especially at the $200 range, are going to be fine for a beginner. Fret buzz is really common and just something you learn to live with on the lower spectrum of instruments. Your focus should be learning the ins and outs of the guitar as an instrument. Eventually you will reach a point where you say, wow, now that I know X and Y about my playing style and ambitions, I really need this other kind of instrument, or this instrument with specific features, etc. But as a beginner, you simply won't know these requirements until you get there. That's how my journey has been, anyway. Your mileage may vary, but I hope you enjoy your journey, and keep it up!! My first move would be take it back to the supplier.There are many reasons for your problem,as explained above, with the addition of a split in the woodwork. For $200 it should be pretty good, but some Chinese stuff is below par. You need to be more specific about the noise : does it happen ALL the time, is it on particular strings, does it occur when you tap the guitar as well, is it on particular frets, is one of the machine heads loose, are you fretting just behind the frets or towards the back, is part of your fretting hand touching a played string, there are too many unknowns for a helpful answer to this question.As Wheat says, a session with a teacher (not necessarily classical) will point you in the right direction. it's the guitar not you i can tell by the shape of that guitar. i have the same probleme when i hear another guitar's sound i feel that what i have is not a guitar. you don't need to be a pro player in order to tell the difference just play the same chord( for example A major ) in both guitar and you will hear the difference. Does anyone make nylon strings for a standard acoustic guitar (non-classical)?